Today, let me throw upon the reader a very general question. "Is there any microbiological laboratory test that is 100% accurate? What's the implication on routine Microbial testing". Take your time to think before you read on. This is one of the question that am often asked by the students. Microbiology in the laboratory should be impeccable as far as the clinical version is considered. If your test is not fully accurate then how confident are you in reporting the result and treat the patient based on the results you obtain? Before i put up my answer let me quote from myself that i often speak about to my students. "There is no experiment that can be setup in a laboratory that is totally 100% perfect. In other words no experiment achieves 100% accuracy". True value - The perfect real value that an experiment tries to measure. This is an ideal concept which cannot be achieved practically. Accepted true value - The value approximating the true value, such that the difference between the two values is negligible. This is what can be achieved. Error - The discrepancy between the result of a measurement and the true (or practically accepted true value). So now i see that you are on track and having a faint idea what I'm heading to. Let me put up a hypothetical case. A 53-year-old male farmer presents for evaluation of a growth on his arm. About a week ago, he noticed some mildly itchy red bumps on his arm. They started to blister a day or two later and then ruptured. During this time he had a low-grade fever, but otherwise felt well. Further questioning reveals that he has had no ill contacts and never had anything like this before. He has cows, horses, goats, sheep, and chickens on his farm. On examination of his right upper arm, you find a 4.5-cm circular black eschar surrounded by several vesicles (blisters) and edema. He has tender axillary lymph node enlargement (adenopathy). A Gram stain of fluid drained from a vesicle and a biopsy from the eschar both show chains of gram-positive bacilli on microscopy. What would be your Best Guess?? Yes, you got it right. Its Bacillus anthracis. The ideal flow of this clinical case will be a sample will be sent to the Lab raising a suspicion of Anthrax bacteria. The lab would grow the bacteria in blood agar. 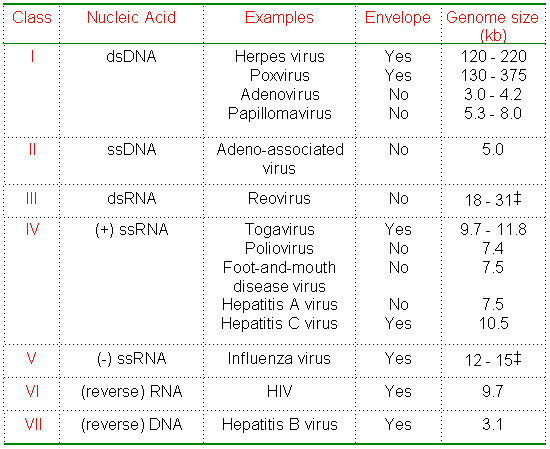 Do some biochemical tests, test for antigen and end up confirming with PCR. And the report goes as "Sample contains B.anthracis". But if you had asked the reporting authority "How confident you are?" Well, its 99%. Where the hell has the remaining 1% gone". Thats not all. The identification is often by biochemical reactions. Reactions are not flawless elements of microbial study. For instance, the reaction may have failed to perform due to various variables such as temperature and other conditions. Even if you had calibrated and maintained all these variables to minimum, variability is still there though not obvious. 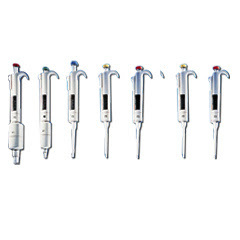 In addition, the calibration is done by comparing with a pre calibrated system which also has been calibrated from another. Considering that the original calibrated system is then used, each time an inevitable error is brought in. And every round this error increases exponentially. I cant resist myself from saying another point. You can identify only what you know. The basic tactic of microbiology is to rule out the some genus/species with each test and end up with only possible species that will give the set of reactions. So, if your test doesn't differentiate then you still have the other possibility. Now that can be a significant error. Now let us assume you have gone a step further and looked into DNA sequence by PCR and confirmed the status. The PCR looks into specific sequences based on the probing region you designed. And even if you have sequenced an entire genome (The method itself has an error), you still will not be able to say "100% IT IS B ANTHRACIS. NONE ELSE". Am not impressing the fact that all the tests are useless. Instead I'm just trying to clarify the fact that there isn't any test that is 100% accurate. In other words, True value is not obtained. One more angle of looking at this. Suppose the total accuracy of Sample collection is 80%, Biochemical testing is nearly 95%, gene testing is 99% then mathematically your confidence on the result is nearly 98%. Which means, if you are to repeat your testing a 100 times then 98 times u will end up with same organism as conclusion. And 2 time on the other side. So i must say that the you should report with good confidence. I could easily disprove that what i get as 2% discrepancy as error and hence should be ignored. So my take home message is despite a negligible error and only 99% confidence your experiment is till worth. The error is unavoidable. On the contrary if your test has large error then the confidence is lost in report. Am a day late in posting my blog for the week. And today i intend to ink a very brief description on an emerging field of microbiology- "Microbial forensics"
A man X holds a grudge on man Y. The best way to eliminate him would be something like to hit him on his head or gun fire etc. But he will be caught by the judicial system (If its good enough!). But then the Man X decides to kill him in a virtually untraceable way (Well not exactly. Thats the theme of this post). He administers the person an infection, lethal enough. Medical report says- "Natural cause of death". Poor microbes to be blamed. If you would argue that this hasn't happened to date, well it already has happened not once, but many times (click here for a source on history of biological war). That's were tracing the culprit comes into scene- "Forensics" we call it. But the delivery system was no ordinary methods and hence so blends with microbiology to yield a new science in its own right- "Microbial forensics". The investigation of anthrax is one of the finest examples of the effect of biological weaponry. The method by which it was traced and acted upon is the best example of Microbial forensics as a tool. In fact the whole field emerged into its existence from this case. So what's the outline of diagnosis? If its untraceable, then how do we solve it? These are one of the few questions that i tried to answer in my (I rather say our) recently published article "Microbial Forensics- Past, Present and Future". Though there are many methods to create biological weapons the common option would be to release microorganism that is potentially pathogenic or may be attenuated to more pathogenic forms and then released into the community which makes it most lethal than any other weapon. And how do we trace? To put in plain english, the method focuses on identifying unique signatures in unique settings. This means when we find something unusual, say for example a lethal infection in a person suddenly on no obvious exposure, a agent that is not prevalent in the place, abnormally behaving organism etc are all indicators of a possible bio-threat. As expected from a novel field, its still under development. Many of the needs are yet to be designed and some of the already designed protocols needs to be upgraded. Needless to say we currently are in a position where we can trace many things and nail down the person who has committed the crime. For an amazing case crackdown please refer to the work by Metzker etal. Since, i have written the opinion myself and if i post a blog post here on the same thing once again repeating the same words that would look boring. So i encourage you to read the article yourself from the link provided in further reading. But I would like to make a concluding remark. Microbial forensics is a technology that comes with heavy and high expectations on functionality. But there are situations were it wouldn't work. And loop hole are now researched upon and sorted out. Evolution of virus- Is it fitting right? I have had a good audience response for my posts on basic stuff than when i came up with research based materials. (Oh ya, ultimately everything is research based, but what i mean to say is recent research). The stats make me say that. So today i decided to write on a topic that many has questioned me. The question reads so "If one strategy of viral replication is very efficient, why do we have 7 basic protocols for viral replication". To make things easy, let me divide this entire discussion to 2 parts- Replication strategy and what's the advantage. 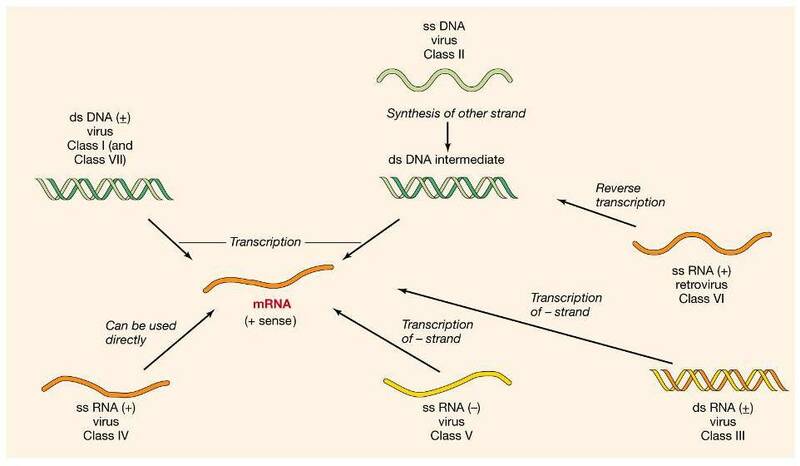 David Baltimore based on his observations concluded that all the virus has to make mRNA to effectively replicate no matter what genome is the virus made up of. The 2nd rule is Only dsDNA can transcribe (Not single) and dsRNA cannot encode protein. The 3rd rule is that the host cell don't encode RNA dependent RNA polymerase (Means the host cannot make RNA from RNA). Since the virus doesn't possess its own machinery it has to use everything from the cell, and if cell don't possess the required material then the virus has to make it. If you know the following diagram speaks for itself. Fig 3: Viral replication strategy (Click here for source). Now let us consider each of the genome. Suppose the genome is DNA based, the best advantage is the virus has a stable genome (DNA is more stable than HIV in cellular conditions). In addition it can make use of the host cell machinery in every way cause the cell itself has DNA. Which means, the virus actually needs to code less (In reality Some DNA virus are really large such as Herpes virus). Alas, but it has to take over the problem of entering the nucleus. And this represents the problem. That is, the nucleus is not permissive to incoming genomes and hence the virus will have to evolve special strategies to enter the nucleus and take charge. So i can conclude safely that here the evolutionary fitness is towards a very stable genetic material- "DNA". Consider the second case, a + sense RNA. RNA is not stable material in cytoplasm because of various factors such as half life and various attacking enzymes. But, this low time availability is compromised by the fact that the + sense mRNA is able to make proteins directly and get out quickly. 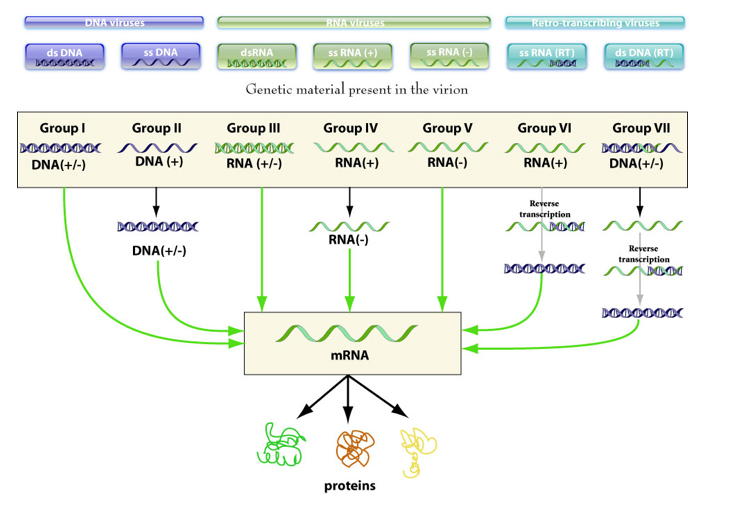 Though we (We means Science here) don't know what's the function of - sense mRNA that will be produced as intermediate to make more + sense RNA i often felt it serves as a decoy. That means the virus is fast, avoids the problem of entering the nucleus and hence codes only for whatever is essential for itself- a cover and a RNA making machinery. This means it can afford really small genome. In this case the fitness is towards feasibility and not stability. Now let's consider the 3rd case, a - sense RNA. This is bit of a trick, as the -sense RNA doesn't make anything. So it has to carry a RNA synthesizing machinery with it and the rest is as for the + sense RNA. Probably, here the -sense RNA is the decoy. The next is a combination of + and - RNA to make a double stranded RNA. This avoids the problem of stability as double stranded RNA is more stable. Oh yeah!! We eukaryotes know how to cleave dsRNA in cytoplasm (refer RNA interference). So in case of RNA machinery no matter which type, the evolutionary preference to maintain is because of easiness of replication than the stability. Retrovirus has the elegance of both worlds. Have an RNA and make a DNA. This means the that the RNA is the material but converted to more stable DNA once inside the cell. HIV for e.g is a +sense RNA virus but instead of taking the routine route, it decides to go to nucleus and integrate. At the cost of what? Yes, at the cost of having to have a strategy to enter the nucleus. But, i would say still this system is best compared to others. Because once inside the nucleus the cell does everything for the virus and the virus just has to control. Which means least genetic material can be carried. One would argue with me easily that this is just blunder. If retrovirus is so good, then this group of virus should have predominated the viral population, which is not the case. Well, that were HERV comes to picture (refer my previous post on HERV). Infact almost every eukaryote has a ERV genome sitting inside its own genome replicating at the cost of host. You may say that its not active, but that doesn't matter. Ultimately the viral genome can parasitize successfully. So, my impression to the question is all the viral replication strategy has evolved either because, its genome is more stable or replication is more feasible. The one which combines the best of both is retrovirus and it is infact evolutionarily the fittest. This doesn't break any rules, does it? Talking always about new research has got a problem. The best understood among them is loss of previous basic knowledge. Well, if you don't believe me then, check it up yourself. Meanwhile let me tell you something that i know for sometime now. Table 1: Features of S hematobium and related species. So, those of you who know about this pathogen, you would also know that this parasite lives in the venous plexus. Thats just equivalent to standing right in front of your enemy army alone and waving saying "hey, look am here". 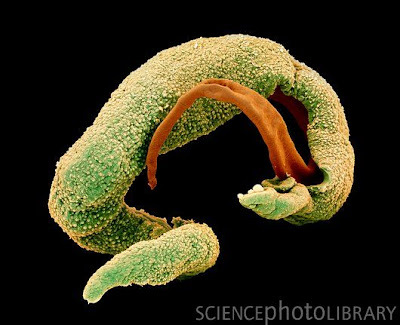 So how does this worm escape wrath of immunity? Hmmm. Let me teach you a magic. If you are to become invisible do u know what the magicians do? Simple. Wear a black suite and stand in front of a black background. The same can be achieved with any color combination. The principle is the color should be the same, so that they blend into the background. Why am I telling u these tricks? Just to tell you this is what the worm does. Schistosomes express a bunch of integral membrane proteins, called tetraspanins (TSPs), in the outer surface membranes of the tegument. These tegument are characterized by the conserved structure of four hydrophobic transmembrane domains, a small and large extracellular loop, an interconnecting intracellular loop, and cytoplasmic amino- and carboxyl- termini. This TSP can mask the inner parasitic antigens, by pasting and displaying the hosts own antigen which is circulating in blood. Just like standing with black cloths on a black background, the immune system is easily fooled by this trick. And the parasite just dances around in the plexus happily continuing its life cycle. 1. Yanyan Jiang etal. Identification and characterization of six novel tetraspanins from Schistosoma japonicum. Parasites & Vectors 2011, 4:190. 2. Tran MH, Freitas TC, Cooper L, Gaze S, Gatton ML, et al. (2010) Suppression of mRNAs Encoding Tegument Tetraspanins from Schistosoma mansoni Results in Impaired Tegument Turnover. PLoS Pathog 6(4): e1000840.